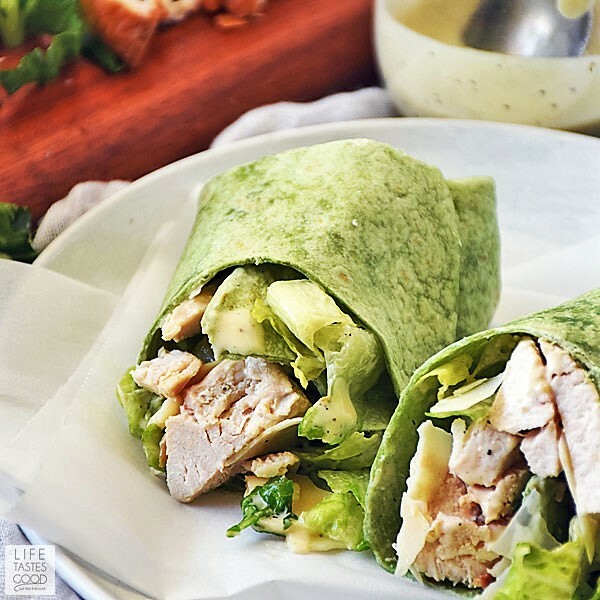 Packed with all the flavors of a classic Caesar salad, this easy recipe for a Chicken Caesar Salad Wrap makes a delicious lunch on-the-go or even a light and tasty dinner. It is easily converted to be gluten free too! The holidays are a time to indulge, but that can be a challenge if you are eating a restricted diet or have guests on a restricted diet. This week on Sunday Supper Movement we are sharing our best Gluten Free Holiday Recipes to help you navigate the holidays with delicious gluten free recipes to ensure all your holiday meals are scrumptious and safe for everyone to enjoy. This week is a very special week on Sunday Supper. Not only are we making your holidays easier by sharing our favorite gluten free holiday recipes, we are also honoring one of our very special members, and good friend, T.R. Crumbley, who passed away earlier this year after a short battle with an aggressive cancer. T.R. lived a gluten free lifestyle and was passionate about sharing his gluten free recipes with the world on his blog. He was a beautiful soul and that shined through in everything he did. Always happy & positive, T.R. never failed to be the first to reach out and lend a hand, answer questions, or talk about the latest episode of Game of Thrones. If you knew him, you were his friend. 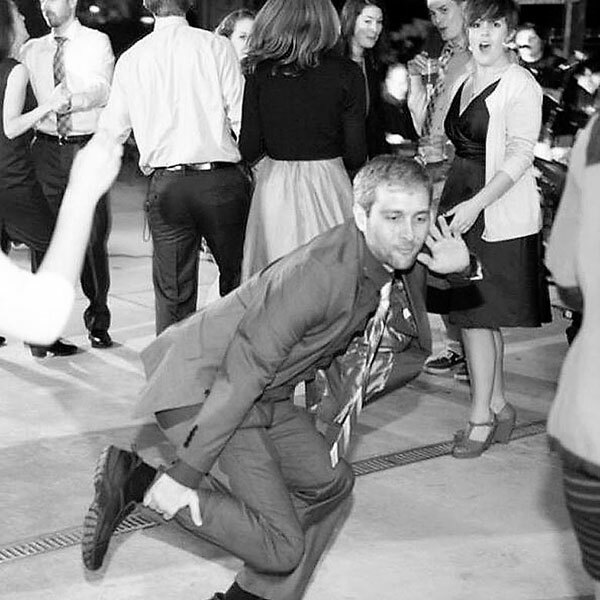 He embraced everyone and was always the life of the party! I can't help but smile through the tears when I think of my friend who's life was cut way too short. Our Sunday Supper family will never be the same without his clever wit. We miss him very much. You can learn more about T.R. by reading Sunday Supper's interview with him, watching his YouTube videos, and visiting his Instagram page. Although, T.R. 's recipe blog is no longer available, he was gracious to share several of his favorite recipes with Sunday Supper. Click here to browse his recipes available on Sunday Supper. 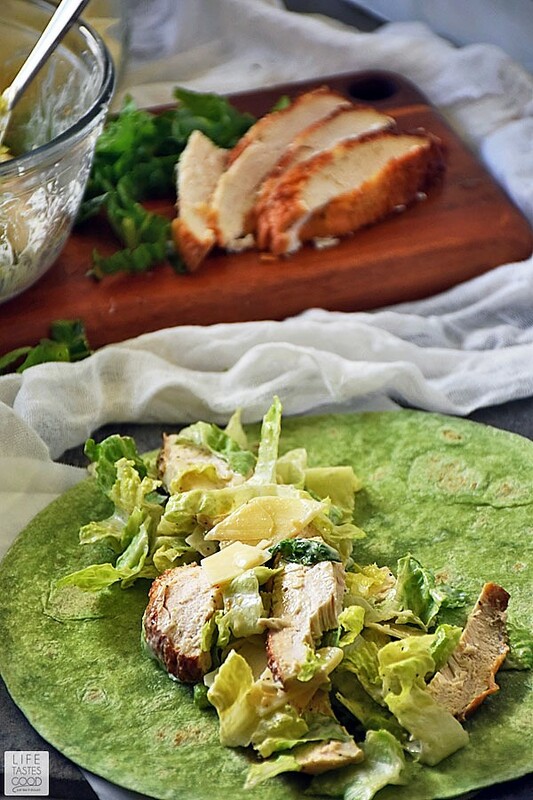 I love this Chicken Caesar Salad Wrap. It is so easy to make and I can't think of a better way to eat a salad on-the-go. With tender roasted chicken breast, fresh romaine lettuce leaves, robust Parmesan cheese, and a tangy Caesar dressing all stuffed into a handy spinach wrap, this is one of my favorite lunch options ever. Sometimes I'll even spread some hummus on the wrap before filling it with my Chicken Caesar Salad, but that's another recipe for another day I suppose. To keep this recipe super easy, I use leftover Roasted Chicken Breasts. Sometimes I'll make a double batch of my roasted chicken breasts recipe over the weekend just so I have the leftovers for lunches and quick dinners throughout the week. A store bought rotisserie chicken is a good option too. I like to use shaved Parmesan cheese in this recipe. The bigger surface area holds the Caesar dressing nicely. However, grated works too. I don't recommend using the powdery, processed Parmesan cheese. I do like homemade Caesar dressing the best, but I'm lazy sometimes, so my go-to store bought Caesar dressing right now is Panera Bread Caesar. It's flavor is pretty well balanced for my tastes. I've never really liked store bought dressing until the Panera dressing came on the scene. I find most have one element that overpowers all the others throwing the flavors out of balance. 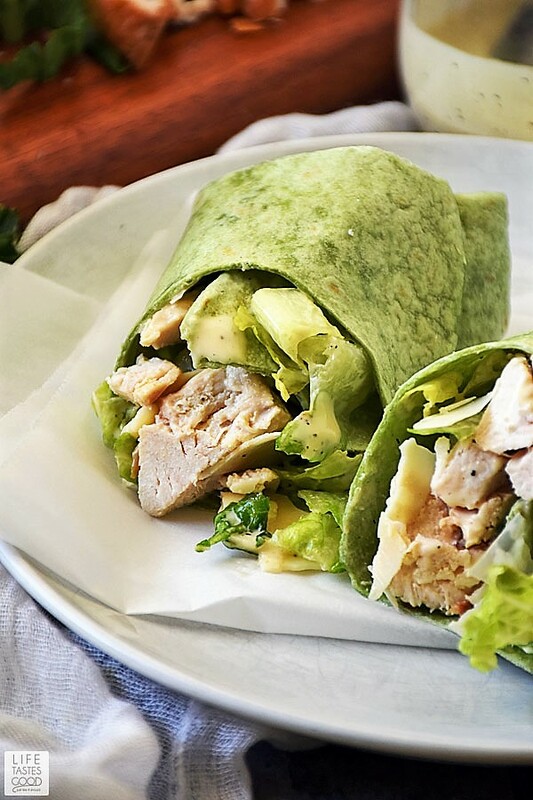 I love spinach wraps and typically use them for all my cold lunch wraps, but the Chicken Caesar Salad flavor will shine through no matter what flavor wrap you prefer. 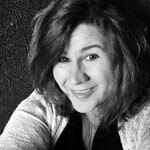 I spoke with my gluten free friend Cricket, of Cricket's Confections, to make sure everything I used in my Chicken Caesar Salad Wrap is gluten free. She assured me I did a good job, but reminded me it's always a good idea to read labels when buying store bought foods like the Caesar dressing. 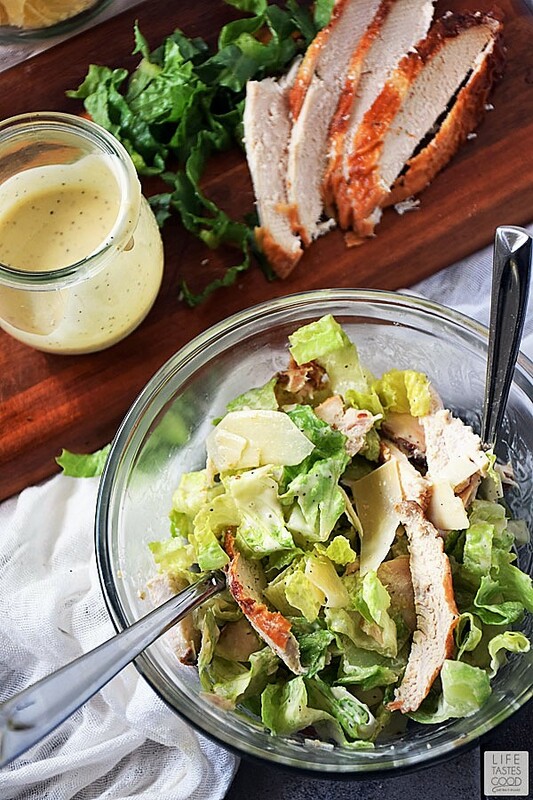 The Panera Caesar dressing I like is gluten free, and Cricket also recommended Marie's Caesar dressing for another option if you aren't able to find the Panera dressing in your grocery store. Be sure to use gluten free wraps. Our friend T.R. reviewed a few brands to help you choose which brand works best. It is a very popular post on Sunday Supper. Click here to check out what T.R. recommended. Be careful not to overfill the gluten free wraps. They tend to tear much easier than regular wraps, so go easy on the filling and you'll have an easier time rolling them up without tears. I found warming the wrap helps with rolling as well, so I recommend warming each gluten free wrap between 2 damp paper towels in the microwave for about 10-15 seconds on high power before filling. This makes the wraps more pliable for rolling. Although this recipe makes 2 regular wraps, I can get 3 good sized gluten free wraps out of this recipe when I'm careful not to fill them too much. 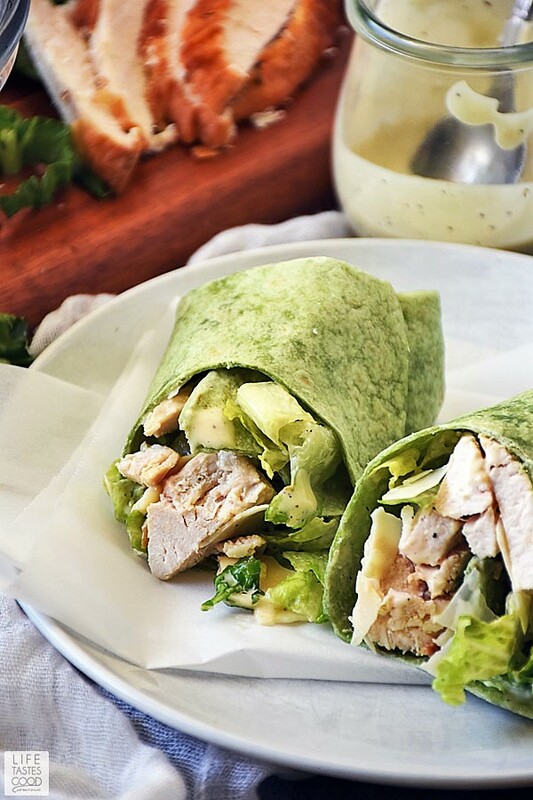 Chicken Caesar Salad Wrap is a deliciously easy way to eat your salad on the go. Perfect for a quick lunch or light dinner! 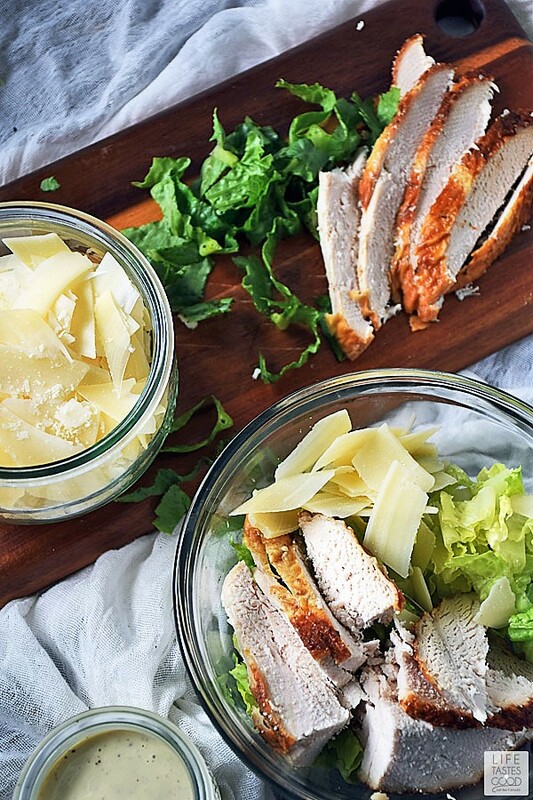 In a medium bowl, combine 4 ounces sliced chicken breast, 1 cup Romaine lettuce leaves, and 1/4 cup shaved Parmesan cheese. 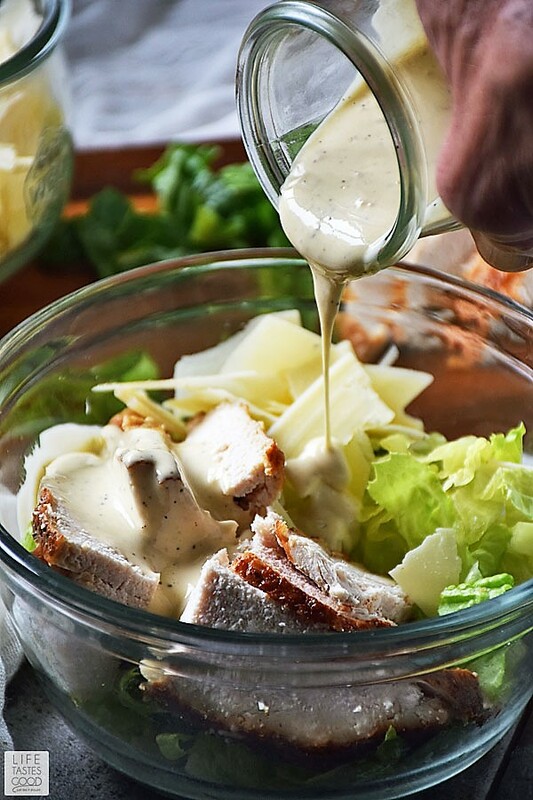 Add 1/4 cup Caesar Salad dressing and toss to coat all ingredients. Add more or less salad dressing to suit your taste. Give the mixture a taste and add salt and pepper to taste. Divide the ingredients among the 2 spinach wraps. Fold in sides and roll up. Serve with Caesar dressing and enjoy! A great twist on a classic! I think this Sunday Supper tribute to TR is fantastic!